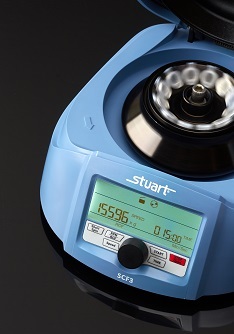 23rd March 2018 - Cole-Parmer Ltd announced today that Stuart®, a leading UK manufacturer of laboratory instruments, is launching the SCF3 Microcentrifuge. Succeeding the SCF2 Microcentrifuge, the new device boasts a significant increase in maximum speed - now up to 15,000 RPM from 13,500 RPM - as well as a reduced weight and lower noise levels. Like its predecessor, the SCF3 is able to spin a variety of tube sizes and strips via its accessory strip rotor, even at its maximum speed of 15,000rpm, making it ideal for laboratories that carry out varied sample tests. The unit comes supplied with fixed angle rotor adapters, which enable 0.2ml or 0.5ml tubes to be centrifuged. The SCF3 is also the smallest microcentrifuge Stuart has ever produced, measuring only 262 x 230 x 131mm. Combined with its impressive, large digital display, this space-saving aspect makes the SCF3 incredibly accessible to any laboratory professional. Plus, as an additional safety aspect, the centrifuge door remains locked while the rotor is in motion, minimising risk to the operator. As with the entire Stuart range of laboratory equipment, the SCF3 is protected by BioCote® providing long-term effective antimicrobial protection against a wide range of bacteria and fungi. "At Stuart, we're constantly innovating to meet our customers' needs. Now, with the launch of our new SCF3, this determination has led to our most advanced benchtop microcentrifuge yet," said Jackie Taylor, Product Manager, Cole-Parmer Ltd.